2009's standout RPG Dragon Age: Origins catered to console fans and PC enthusiasts alike by evoking the classic style of Baldur's Gate while still providing a visceral story-telling experience. 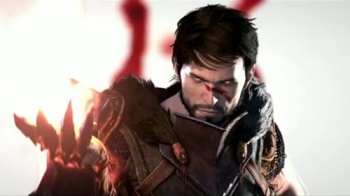 For the sequel, Mike Laidlaw's team at BioWare wanted to bring that style even farther into the current generation by increasing the action and "streamlining" dialogue choices. Of course, Laidlaw calls "streamlining" a dirty word in RPG terms, he doesn't see action and ease of play as being counter to the tenets of classic RPGs. Dragon Age II is coming out next Tuesday March 8th on the PC, Xbox 360 and PS3. Even though it seems Dragon Age II is coming quick on the heels of its predecessor (released only 16 months later), Laidlaw said that the PC version of Origins was finished more than a year before its release. While other teams completed the Xbox 360 and PS3 versions so that they would release simultaneously, the design team was already working on a second iteration based on what they learned the first time around. And now that the team has the tools and the process down to a science, Laidlaw said that we can expect them to crank out content fairly quickly. That means a buttload of DLC is coming down the pipe as we speak. Greg Tito: One of the complaints of Dragon Age: Origins was that the difficulty was tuned pretty high even on the normal setting. I've played about 30 hours of Dragon Age II so far for my review on normal, and I haven't really had a full party wipe yet. Do you think that you might have tuned the difficulty down a little too low? How hard was it to try and get the challenge into the "sweet spot"? Mike Laidlaw, Lead Designer of Dragon Age II at BioWare: What we did is we used an approach where we tried to develop essentially rules for the players, in terms of what our expectations were. So when we threw quality assurance and testers and focus tests at it, we knew what our expectation was. Our goal with the game really for normal is that you as a player should be playing one character optimally, whether that be Hawke or you focus on one of your followers. You've got one character that you've buffed up, got the right combination spells, you're playing them well. You shouldn't see huge instances of party wipes. You should be able to get through the game feeling like you're challenged but if you're smart you're able to get through it and survive. You might lose a person or too, and there's certain boss encounters where it might take you a couple of tries to figure out the tricks and evaluate how that is. To me, that's a fair expectation for normal, it presents the player with difficulty to keep them interested but without it being frustrating and fist punching our controllers. Then for hard and nightmare, our goal is to move up to hard, our expectation is the player will be playing the whole party effectively. You've been building your talents to work together and so on and so forth. As a result, the game for hard becomes quite a bit more challenging because we're expecting you to be not 4 times efficiency but quite a bit more efficient.